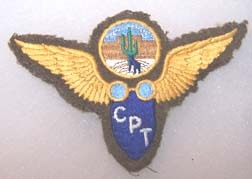 WWII Arizona Civilian Pilot Training program Patch. About five inches wide. machine embroidered on od wool. Has been removed from a uniform. Probably worn by the instructors at Falcon Field. Very rare piece of insignia.